Borrower’s cards are issued free the first time. Photo ID and proof of address are required to get a borrower’s card. Lost cards are replaced for $2.00. Borrower’s cards for children ages 5 to 11 years are issued in the Children’s Room. 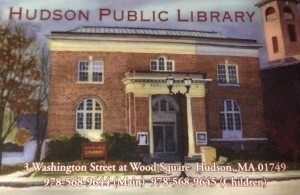 Children and adults may use their cards in either department, or at any C/WMARS participating library. You must present your Library Card or Library Card number for any and all transactions. Hudson items are checked out for 3 weeks. All print materials and DVDs may be renewed once. Books and print materials are $.05 / day, per item up to a maximum of $.50 per item. Blu-rays and DVDs are $.50/day, per item up to a maximum of $2.00 per item. Museum passes $5.00 late fee, not waived on Fridays. Kindles $5.00/day, up to a maximum of $20.00, not waived on Fridays. Launchpads $5.00/day, up to a maximum of $10.00. Items from other libraries may have different rules. Patrons may request items from any C/W MARS library. Patrons can have up to 20 holds on their account at a time. Items from other libraries may have different loan periods. Interlibrary loans are special requests that come from libraries outside of our network, often out of state. It may take a few weeks for ILLs to arrive. We will contact you by phone or email when the requested items are available. Please contact the circulation librarian at 978-568-9644 for more information.